Metal Detecting In North Dakota? Metal detecting in North Dakota follows the Antiquities Act of 1906. Please click on the link below for an explanation of that law, and some of the problems people face who break this law. Be sure and read through the entire page at the link I have provided. In addition, I have linked to other pages that help to clarify that law, and another law pertaining to digging artifacts. Even though The Antiquities Act does not specifically mention "metal detecting", you need to understand what it says about digging artifacts. Others have broke this law and were arrested and fined. By the time you are finished reading this information you will know what you cannot do. The Antiquities Act of 1906. One of the major issues of North Dakota archaeologists is the destruction and removal of Indian burial grounds and Indian artifacts. In most of the western and southwestern States, sacred Indian grounds have been an issue. For years, looters, and thieves, I call them scumbags, have pilfered these sacred areas. Because of this problem, archaeologists and the States have been watching our hobby very closely. Due to the scumbags who loot these sacred grounds, as well as historic battlefields, all of us now pay the price of having our freedom to metal detect infringed upon. National Historic Preservation Act - NHPA. If you are metal detecting in North Dakota, especially on State Land, do not dig anything that you believe is an artifact, or anything that is older than 100 years. For detecting in North Dakota, town, village and city parks, you'll need to check with those local officials. Remember, the Antiquities Act of 1906 and the NHPA, refer to digging and removing artifacts on State or Federal lands. For detecting in North Dakota on private property, you only need permission from the property owner. My Tv Series Was Not Liked By The Archaeologists. 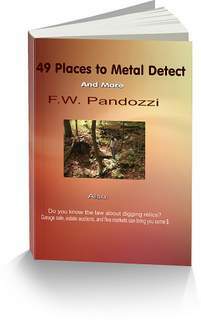 Have you been metal detecting in North Dakota ghost towns? They exist in the east as well. Be Careful, Do Not Break The Law!